Given how important digital marketing, social media and big data have emerged in defining and implementing customer-centered strategies, Stanford’s first-ever Digital Marketing Program looked worth attending. I look at education like an accelerator; it can propel both individuals and entire organizations to their goals faster, with greater insight and clarity. Stanford’s Graduate School of Business (GSB) Executive Education hosted the Digital Marketing Program over three days last week, August 29th through the 31rst. The entire program was held at The Knight Management Center, a state-of-the-art eight building complex that Phil Knight, founder and CEO of Nike funded and assisted in the development of. Dr. Baba Shiv, Sanwa Bank Limited Professor of Marketing and Director of the Strategic Marketing Management Executive Program, hosted the three-day program. Dan Epelman, Director of Programs at GSB is a pro at the logistics of getting a program like this together. The Digital Marketing Program is restricted to Strategic Marketing Management (SMM) current participants and alumni. I attended the SMM Program in 2010 and am still using the lessons learned in my job and teaching. It is well worth attending, it’s a great learning experience. Rishad Tobaccowala, Chief Strategy & Innovation Officer, VivaKi who spoke on Securing Tomorrow: Strategies and Approaches for a Digital World. Ian Sigalow, Partner at Greycroft, Chris Moore, Partner at Redpoint Ventures and Roger Lee, General Partner, Battery Ventures participated on a panel titled Technology Trends: A Venture-Capital Perspective. Andreas Weigend, former Chief Scientist at Amazon.com spoke on How to Use Social Data to Rewrite the Rules. Anneke Jong, Director of Business Development, Bre.ad, Tech Columnist, The Daily Muse and Forbes moderated the panel The New Tools: Putting Digital Marketing into Practice. Justin Ferrell, former Director of Digital, Mobile & New Product Design at Washington Post and currently a Knight Journalism Fellow at Stanford University presented on Washington Post’s Transition to Digital. Maarten Albarda, Vice President, Consumer Connections, Anheuser Busch InBev spoke on Successful Digital Marketing Campaigns in the B2C Space. Sander Arts, former Vice President, Marketing and Communications, NXP provided insights into the B2B aspects of digital marketing in his presentation Leveraging Digital Marketing in the B2B Space. A quote from his presentation “Digital is like hydrochloric acid, it burns through everything” resonated through the three days of this event. The future of retailing is delivering exceptional customer experiences daily – expect to see BestBuy dedicate 70% of floor space to creating excellent experiences for example. Mobility is now a cornerstone of marketing and sales; State Farm has 1,000 developers working on mobile solutions for quoting, pricing and claims management today. Ian Sigalow, Partner at Greycroft, Chris Moore, Partner at Redpoint Ventures and Roger Lee, General Partner, Battery Ventures provided the following perspectives from their panel titled Technology Trends: A Venture-Capital Perspective. Digital marketing automation companies including Eloqua and Marketo are having the most success in both B2C and B2B markets as the processes they are replacing are manually-based and lack analytics. The same holds true for Constant Contact and Exact Target. They continue to see trade show dollars increasingly going to digital media in most marketing budgets. The VC panel agreed that “social media is like fruit”, you need to be selective in how you orchestrate elements together. Having a Facebook fan page alone does not make you social; it is just one element in a much broader mix of social platforms and strategies. Ian Sigalow of GreyCroft said that personal reviews of products can increase conversion rates by 100% or more. He said that Angie’s List, Trip Advisor, GoGoBot and sites that allow for personal reviews have great potential to accelerate online selling based on personal recommendations. Social media is PR 2.0 according to Ian Sigalow, based on the start-ups and intensive focus on marketing automation today he is seeing. Analytics, social and mobile are dominating new venture projects they are being presented with and have involvement in today. Cross-social platform support and social integration are very hot right now and needed in the market. All VCs agreed this is an area of the market with significant growth potential. Publishing, landing pages and analytics & dashboards are three areas of social media that are critical to getting right to make a digital marketing strategies succeed. CRM is in for a disruptive series of innovations to streamline compliance and increase adoption. Panels agreed that while Salesforce has done well on the SaaS platform, it is getting a reputation in larger corporate accounts of being hard to customize and use. The VCs all agreed that the Facebook-like interface of Chatter is a good start, yet they see entirely new application programs capable of gaining even greater adoption in corporate accounts needing CRM. Mobility is dominating the VC landscape. Chris Moore had an excellent quote, “mobility is the link between the digital world and the offline world.” He also said within a year 50% of Facebook traffic will be mobile, which is why they are spending so heavily on development resources on the platform. The VCs agreed that Facebook must make mobility excel if they are going to grow, otherwise they will be overtaken by next-generation social networks in five years or less. The social data revolution happening today is one of the primary catalysts of big data’s growth. This extends to personal travel and location-based mobile data. Dr. Weigend gave an example of personal mobility data, showing appointments and travel in the Palo Alto area in the picture to the right. The 4Cs of Marketing have become more important and relevant than the traditional 4Ps. The 4Cs include Content, Context, Connection and Conversation. Dr. Weigend says that marketers who are earning the most trust look at these 4Cs as an ecosystem that has to be continually provided valuable, unbiased, intelligent content. The social graph of your customers is the new segmentation. AT&T had a .28% adoption rate for a new service using segmentation. When they used the social graph of their customers, the adoption rate increased 4.8X to 1.35%. Both Sander Arts, former Vice President, Marketing and Communications and Maarten Albarda, Vice President, Consumer Connections, Anheuser Busch InBev delivered excellent presentations showing how personas are equally effective in defining customer needs in B2B and B2C markets. Sander also shows how precise multichannel-based promotions can be defined and tracked on social media. Maarten’s presentation showed how state-of-the-art Anheuser Busch InBev is in the digital and social marketing strategies. Both presentations are so rich with content they deserve posts on their own. 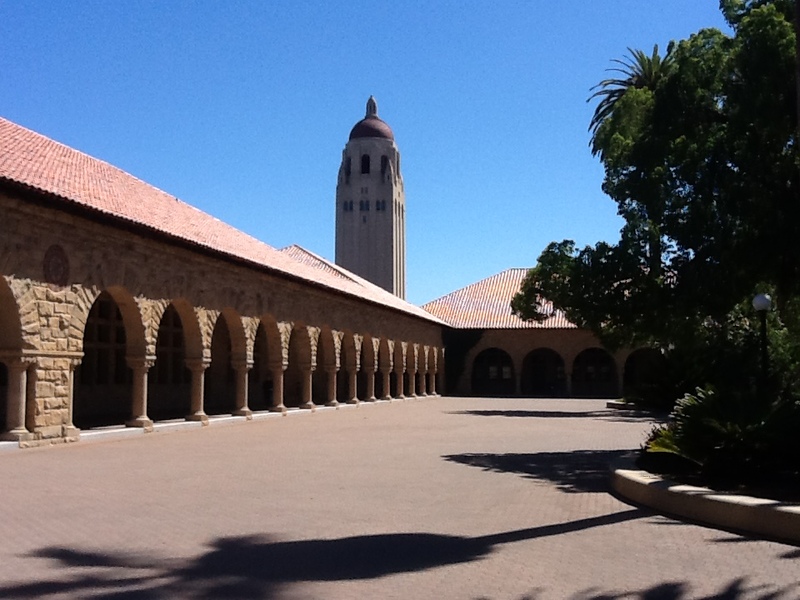 Bottom line: If you get a chance to attend the Strategic Marketing Management Program at Stanford, also sign up for the Digital Marketing Program too. It’s worth it. It’s a great learning experience and the people this program attracts both at the participant and speaker level are outstanding. I enjoyed learning just as much from the participants as well.